Zero turn mowers give you the ease and convenience of mowing easily around obstacles or through tight spaces. These mowers can make a 360 degree turn on the spot without moving an inch in either direction. A zero turn mower doesn’t have a steering wheel like conventional riding mowers, but instead handles to control each wheel. 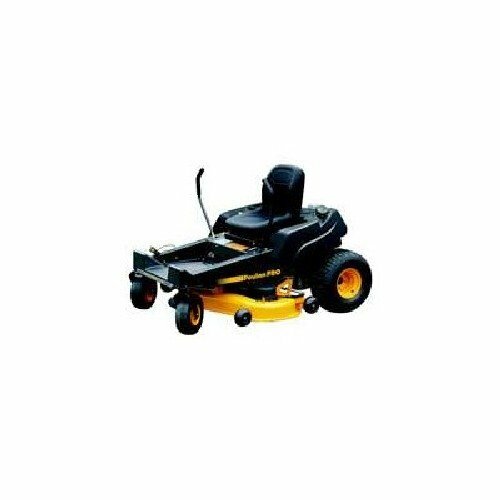 This allows you to easily mow tight spaces with the convenience of a riding mower. The following are ten of the best zero turn mowers currently available. The Poulan Pro zero turn mower provides a 54 inch cutting deck with a 24 horsepower Briggs & Stratton engine to give you plenty of power. A 15 inch back seat provides comfort with a higher position. The adjustable cutting height gives you wide flexibility from one and a half inches to four inches with half inch increments. With a top speed of six mph and fuel capacity of three and a half gallons, this mower can mow nearly three acres per hour. The Poulan Pro cuts mowing time in half compared to regular mowers. The time difference comes from superior maneuverability and the ability to get close to objects for a perfect trim every time. The Husqvarna z254 54 inch zero turn mower gives you performance and style with its cutting edge features and brand new design. 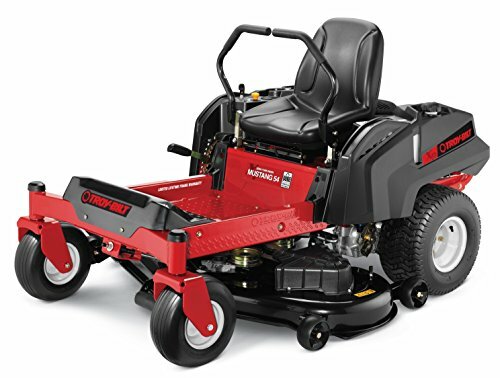 This mower is powered with a Briggs & Stratton 24 horsepower engine and cooled with an oversize fan to help improve both performance and durability. The mower pulls air through the top and bottom of the cutting deck, which lifts the grass for a better cut. There’s no need to worry about transmission maintenance with the zero-turn integration, and heavy steel gives the cutting deck reinforcement for a longer lasting machine. Ergonomic controls gives you easy access to everything and convenient features like an anti-slip area for feet and automatic parking brake make this mower anything but a chore to ride. 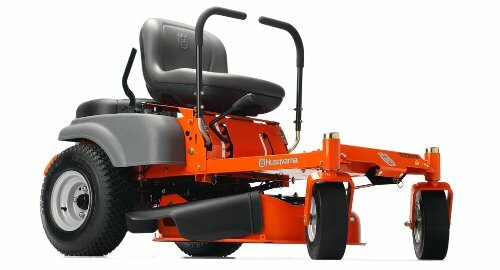 The Husqvarna z246 zero turn mower boasts a 23 horsepower Briggs and Stratton V-Twin engine and 46 inch cutting deck. This mower is part of Husqvarna’s new z200 series and features a cutting edge mowing system that lifts grass to give a perfect cut. A strong frame construction increases durability and reduces flex in the chassis. The z200 series adds a range of convenient features too such as LED headlights on the bumper, a rear engine guard and removable foot pan. The Swisher 54 inch zero turn mower is back by the manufacturer’s over 60 years of experience in the industry. 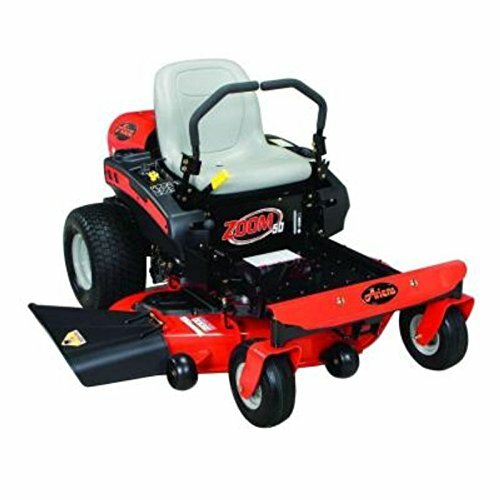 This mower offers an electric start feature and a 24 horsepower Briggs and Stratton engine. It easily makes a full 360 degree turn and combines this with a low center of gravity to give good maneuverability. A rapid response control system gives this mower responsive control and ease of use. 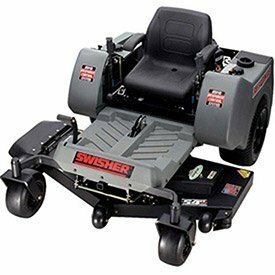 The Swisher Response offers a 54 inch cutting deck and three Gator mulching blades. The frame is made of heavy duty steel and the transmission uses a Hydro Gear 2800 with Ogura clutch. The deck lift is foot assisted for easy up and down motion. An eight gallon fuel tank means less downtime for large jobs and an eight mph speed in forward and reverse makes mowing go quickly. 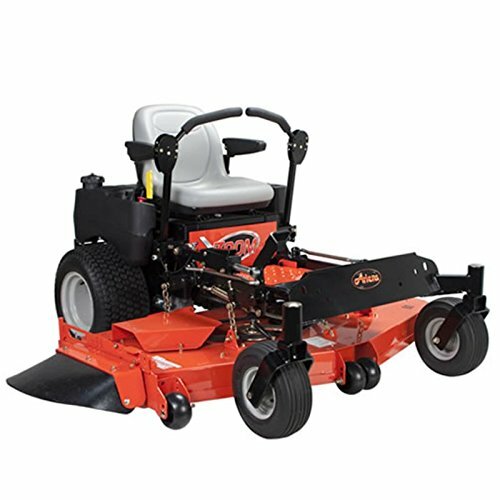 The Ariens Max Zoom zero turn mower offers a 25 horsepower Kohler 7000 series engine with a 60 inch cutting deck. This mower has commercial grade power with high capacity filtration. The Twin ZT-3100 hydrostatic transaxles offer smooth control and consistent power. An eight mph forward gear speed and four mph reverse gear speed give you a fast and efficient machine. The deck lift is foot-operated and provides nine cutting heights from one to five inches. The high-back seat provides armrests and is fully adjustable for maximum comfort. The control arms are also completely adjustable and padded against vibration. A six gallon fuel tank means long or multiple jobs won’t require refueling downtime. 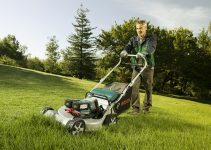 The Ariens Zoom 50 inch zero turn mower offers a 22 horsepower, twin-cylinder Kohler engine for powerful performance and hydrostatic transaxles for responsive controls. A comfortable, high-back seat makes it easier to do longer jobs. 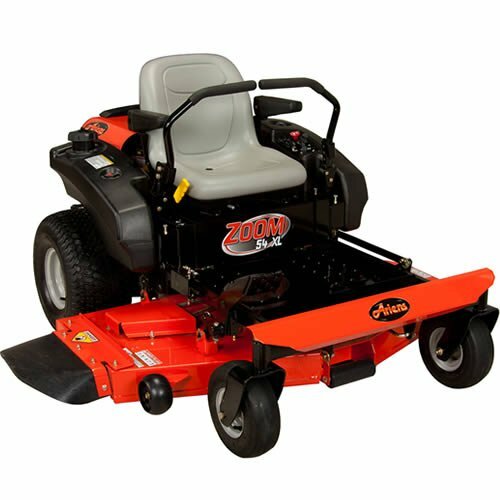 Ariens Zoom features a 50 inch cutting deck with a triple blade to cut more grass in less time. The deck is stamped steel and features three spindles. Side discharge is standard for user convenience, and the zero turn radius gives pinpoint control in maneuvering. With a top speed is six mph in forward gear and three mph in reverse, the Ariens Zoom zero turn mower can move very comfortably. The frame is constructed of fully welded steel and the front axle is fixed for increased durability. The deck lift is foot-operated and offers a total of seven cutting heights between one and a half up to four and a half inches. Both the high-back seat and the control arms are fully adjustable. The fuel tank holds two gallons and the deck offers a washout port to easily keep it clean. 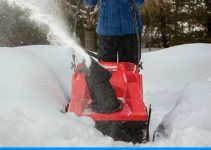 Offering a strong 25 horsepower Briggs and Stratton twin cylinder Intek engine, the Troy-Bilt Mustang zero turn mower gives a quick and efficient cut. The 54 inch cutting deck is equipped with a triple blade and convenient side discharge. The integrated washing system helps keep the deck clean with minimum effort. The deck can also be adjusted to eight different positions for flexible cutting options. The mower can reach seven mph in forward gear and 2.5 mph in reverse. The high-back seat and dual suspension provides hours of comfort for long jobs. An innovative electric take-off system provides quick and simple blade engagement. The Poulan Pro 541ZX zero turn mower offers a 22 horsepower Briggs and Stratton engine with a 54 inch cutting deck. The electric clutch and EZT drive system are relatively maintenance-free and a three and a half gallon fuel tank means quicker work time on large jobs. Adjustable cutting height goes between one and a half and four inches, and it also features a three-blade engagement system. The sliding vinyl seat provides plenty of comfort for long mowing times. Other features include an air cleaner, padded levers, six mph top speed and anti-scalp rollers. The Ariens 54 inch zero turn mower delivers power and performance with a 24 horsepower Kohler Courage Twin engine and 54 inch wide cutting path to cut more grass with each pass. The nearly four gallon fuel tank means longer operation time and less downtime, which is idea for professional landscapers or those with large areas to mow. The back seat sits high and the cockpit has an ergonomic design to deliver maximum comfort. The frame is fully welded steel and the deck is made of solid steel for a strong construction and longer durability. The Husqvarna 30 inch zero turn mower offers the ease and convenience of a zero turn mower in a compact package. The steel cutting deck is 30 inches and stamped 13 gauge. The Briggs and Stratton engine is made for endurance and puts out 16.5 horsepower. One blade requires manual engagement and the transmission is a maintenance-free dual hydro-gear EZT drive system. The RZ3016 offers easy to use controls and a smooth operation. 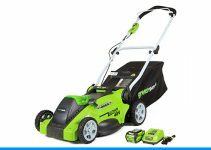 It also features a 12 volt electric start, adjustable cutting height from one and a half inches to four inches, and a three gallon gas tank.